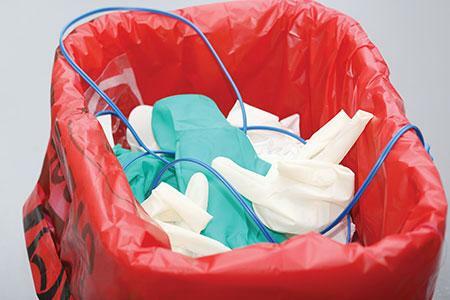 U.S. hospitals could have trouble handling and disposing of Ebola-related waste if they begin to treat infected patients, potentially threatening public safety. The hemorrhagic fever is transmitted through bodily fluids and produces significant vomiting and diarrhea in people it infects. These fluids would be considered biohazards and require special handling and disposal that few hospitals are prepared to carry out. As health officials entertain the possibility that more Ebola cases could arrive in the United States, it’s a logistical problem hospitals are starting to consider. The challenge was highlighted Wednesday in a report by Reuters, which chronicled how doctors at Emory University in Atlanta handled Ebola waste in the course of treating two infected missionaries. Patients were generating “up to 40 bags a day of medical waste,” according to Emory assistant professor of medicine Aneesh Mehta. And the hospital’s disposal company, Stericycle, reportedly refused to handle the material at first. So clinicians found a temporary solution: 32-gallon rubber containers with lids from Home Depot. Later, they used a special sterilizer to neutralize the waste before passing it to the company for disposal. Reuters noted that few hospitals have the ability to sterilize materials on site like Emory. “For this reason, it would be very difficult for a hospital to agree to care for Ebola cases. This desperately needs a fix,” Dr. Jeffrey Duchin, chair of the Infectious Diseases Society of America’s Public Health Committee, told the wire service. Federal health and transportation agencies are reportedly meeting to discuss and resolve the issue.